Florida manatees are huddling together as temperatures drop. Humans aren’t the only ones who need to stay warm when the temperature drops: Manatees, sea turtles and other marine life have to keep themselves warm, too. In an attempt to escape South Florida’s unusually cold temperatures, manatees huddled together in Port Everglades Friday morning, video footage shows. According to the Florida Fish and Wildlife Conservation Commission, manatees typically gather in warm-water habitats such as discharge canals at power plants when impacted by extreme cold temperatures. Warm-water habitats play a crucial role in manatee’s survival during the winter months, the FWC said. Currently, the state is working to sustain “adequate winter habitats” for the threatened species. 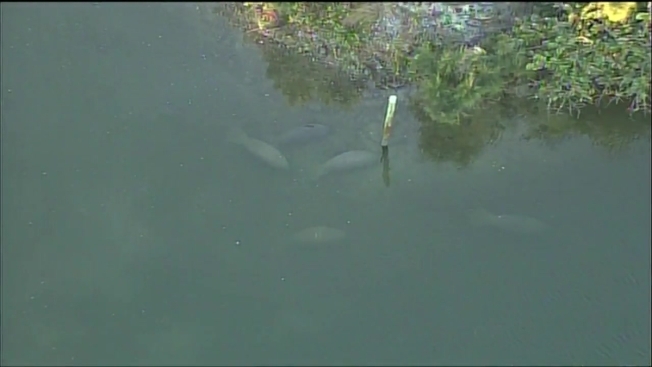 The FWC is urging boaters to avoid areas where large numbers of manatees are gathered, according to a news release. The FWC also asks boaters to watch for manatees in shallow waters near the coast (both inland and coastal) and to obey manatee speed zone signs. “Aggregated animals should not be disturbed, as this could cause them to leave the warm-water sites that help them cope with cold temperatures,” said Gil McRae, head of the FWC’s Fish and Wildlife Research Institute. Sea turtles are also feeling the effects of South Florida’s frigid temperatures. As water temperatures drop, stunned sea turtles may float limply on the surface of the water or close to the shore, the FWC said. Even though these stunned sea turtles may appear dead, they are often still alive, the FWC said. The organization urges anyone who spots sea turtles in this condition to report them to the FWC Wildlife Alert Hotline. Floridians can also report a dead or distressed manatee by calling the same hotline at 888-404-3922.